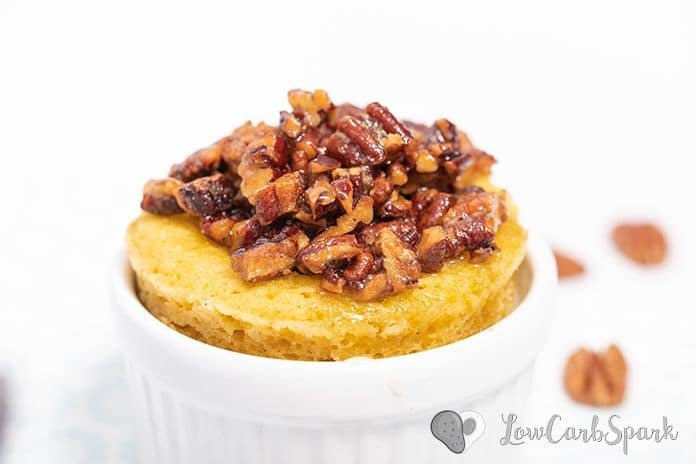 This keto Pecan Pie Mug Cake is a moist, delicious treat that’s extremely easy to make and low in carbs. It’s ready in 90 seconds. Enjoy a fantastic keto dessert that’s full of flavor and has only 4g net carbs. 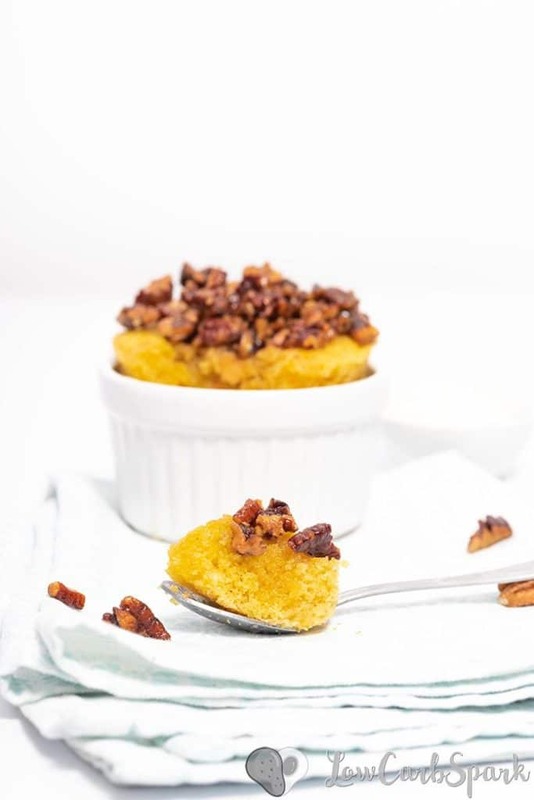 Top the mug cake with this fabulous sugar-free caramelized pecans. I am very serious when it comes to mug cakes since they are the easiest keto dessert you can make. You’ll love my Keto Brownies Mug Cake or my Lemon Poppy Seed Mug Cake. I love to serve this low carb mug cake warm with a big scoop of vanilla ice cream and sprinkled with more cinnamon or ground nutmeg. Well, that’s I call a comforting dessert! 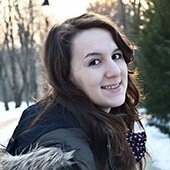 *substitiute for paleo or dairy-free! Add all the ingredients for the mug cake into a medium bowl and whisk to combine until smooth. Grease a microwave safe mug or ramekin with butter or refined coconut oil. Transfer the batter to the greased mug and microwave for 90 seconds or until the top is firm. Make sure you don’t overcook your mug cake or else it will be dry. To make the caramelized pecans heat a medium not stick pan over medium-high heat. Add the butter and sugar substitute. Add the chopped pecans into the butter mixture and stir well. 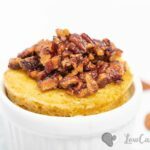 Top the mug cake with the keto caramelized pecan pie topping. Enjoy it warm! 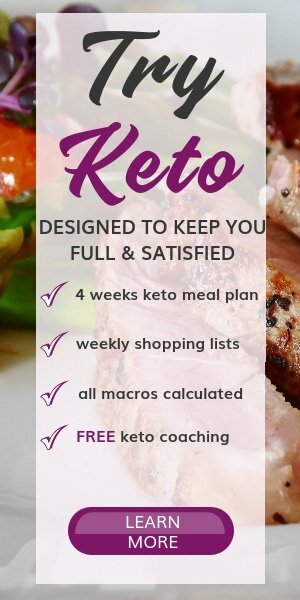 Serve it with sugar-free keto ice-cream or with whipped cream. 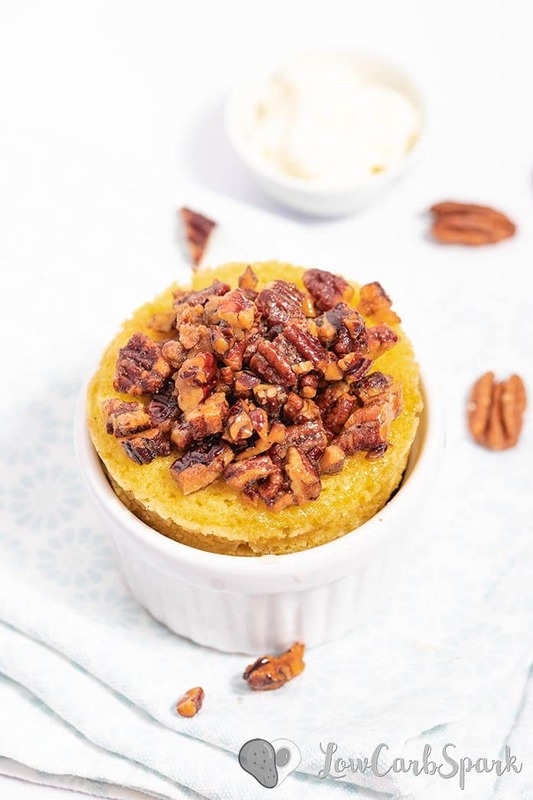 This keto Pecan Pie Mug Cake is a moist, low-carb treat that’s ready in 90 seconds. 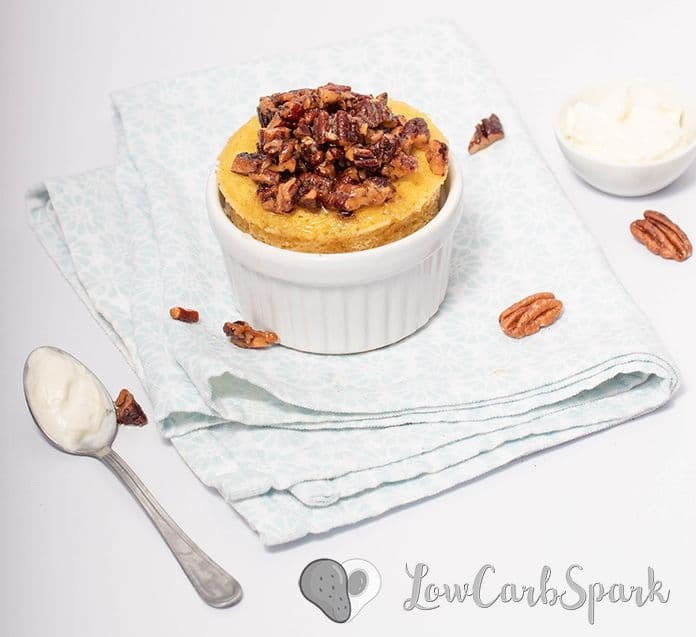 Enjoy a fantastic keto dessert that’s full of flavor and has only 4g net carbs. Add the chopped pecans into the butter mixture and stir well. Let the pecans caramelize for 2-3 minutes, whisking constantly. To make this dessert paleo friendly you can substitute the butter with coconut oil and heavy whipping cream with coconut cream. Use a paleo sweetener: raw honey, maple syrup, coconut sugar, stevia, monk fruit.